How does the GC420 differ from my current 4‐inch 28‐series printer? Mechanically the printer is very similar. It provides a dual‐walled, robust construction; however, electronically, the printer is very different. A whole new electronics platform provides a wealth of features. What are the main differences between a GC420 and legacy 4‐inch printers? The GC420 offers faster processor capabilities, dual resident command languages, enhanced interface options, ZBI and Unicode. Can I upgrade my existing 2844 or 2844‐Z printer to a GC420 by simply installing firmware? No. The printers have different main logic boards. My customer likes the size of TLP2844. Can we get 300dpi resolution in this size? Yes, a thermal transfer GX430t is available. What options and accessories are available for the GC420? For a complete list of available GC420 options and accessories, please consult the GC420 price list. Are the GC420 printers Windows compatible? Yes. All GC420 printers include a Windows driver. This driver will allow the printer to be used inconjunction with popular Windows applications. The Windows driver will enable the end user to design labels in their applications of choice for print output directly to the printer. Certified and Vista supportive ZebraDesigner drivers are available to download from our web site at www.zebra.com. Are the GC420 printers compatible with other Zebra printers? Yes. The GC420 printers have dual resident command language. The co‐existent EPL and ZPL allows for seamlessly integration into legacy and current installations. You can swap your older Eltron desktop printers or add to existing applications, including ZPL based mid‐range and high end installations. I need support of EPL Line Mode. Does the GC420 support this? Yes. The direct thermal GC420d supports the legacy Line Mode of operation. What connectivity options are available? 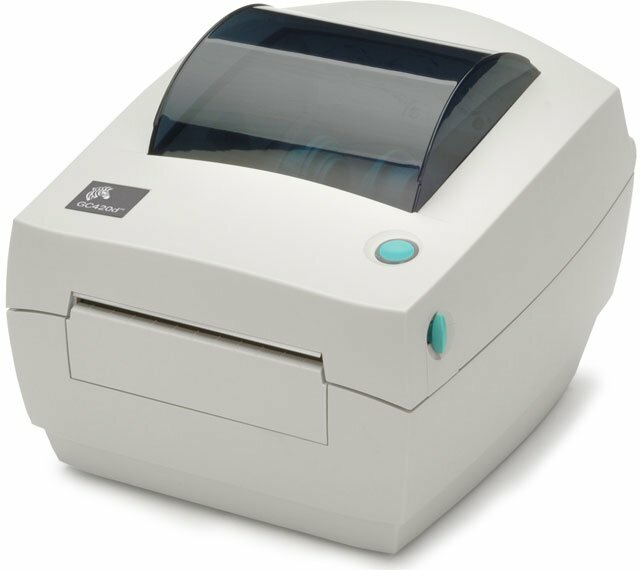 GC420 printers have three interface ports as standard; serial, USB and Centronics parallel. Ethernet support is available via our external 10/100 print server that attaches to the GC420 printer’s parallel port. How much memory is standard on the GC420 printers? The GC420 printers have 8MB SDRAM and 8MB Flash as standard. Extended memory and Real Time Clock options are available on the GX models. I need support of EPL2, which GC420 models have this? All GC420 printers have dual resident languages. The co‐existing EPL2 and ZPLII mean that any GC420 printer will understand and process either programming language. Can the thermal transfer units operate in direct thermal mode? Yes. The GC420t can operate either with or without a ribbon to achieve both direct thermal and thermal transfer modes of operation. I would like to upgrade from my older 4‐inch 28‐series. Will my labels be okay for use? Yes. The media handling of the GC420 will support your older media roll. However, it is recommended that you verify the print position as being correct and make any adjustments to your format or command code as necessary. Can I use my 4‐inch 28‐series ribbons on the newer GC420t? Yes. Common ribbon handling has been maintained. Can I use my existing wristband media in the GC420? Yes. Common media handling means that your Z‐Band Direct or Z‐Band 4000 can be used in the newer GC420d and GC420t printers respectively. Can I use my media adapter kit in the GC420d? Yes. The newer GC420d will accommodate the media adapter guides from your LP2844 or LP2844‐Z. Will the Zebra Keyboard Display Unit (KDU) work with the GC420? Yes. The auto‐sensing of the serial port will ensure support without modification or adapter. Does the GC420 have the same serial port configuration as the 2844 or 2844‐Z? The adaptive auto‐sensing of the printer’s serial port will ensure support of either straight through or null modem configurations, so support for both legacy 2844 and 2844‐Z serial interfaces. Does the GC420 have the same parallel port configuration as the 2844 and 2844‐Z? Yes. All the 4‐inch desktop printers’ parallel ports utilise a Centronics interface. Is the 10/100 Ethernet option field upgradeable? No. GC420 Ethernet support is via an external print server. Internal Ethernet is available on the GK and GX models and must be chosen at the time of purchase. Can I use my older external ZebraNet 10Base‐T print server on the GC420? Yes. The parallel port enabled GC420 printers will support the external PrintServer II. Do the printers have OPOS drivers available? Yes. A UPOS compliant driver based upon the UPOS v1.11 specification with support for both .net v1.1 and Active‐X are available. The drivers and associated programming guide can be downloaded from the utilities section of our web site at www.zebra.com. What printers does the OPOS driver support? The current mobile, desktop and mid‐range printers that use the ZPL programming language are supported for integration into the existing Windows based point‐of‐sale application. Are any instructions available to aid installation? An in‐depth user guide accompanies the driver download and provides an overview of the driver installation and set up as well as the driver’s own test application. What ships with a GC420 printer? What is Zebra Setup Utilities? Printer Settings Wizard – Step through this wizard and configure basic and advanced printer settings, including label size, media type, hardware options and more. Print Quality Wizard – Step through this wizard to select a print speed and darkness setting that best suits your media. Make the selection from a range of printed labels. Alternatively, manually select a print speed and darkness setting. Connectivity Wizard – Step through this wizard to configure Wired and Wireless Ethernet or Bluetooth settings. Fonts and Graphics Downloader – Convert fonts and graphics and download them to the printer. Printer Tools – A window containing many common functions to control the printer, such as loading factory defaults, list stored objects, download files and many more. Direct Communication Window – Open and edit multiple files and send them to the printer, or view data returned by the printer. Where can I get a copy of the Zebra Setup Utilities? Zebra Setup Utilities is available from the Drivers section on Zebra.com. Which printers and printer languages are supported? The Zebra Setup Utilities supports Zebra desktop, mid‐range and high‐end printers. It supports both the ZPL and EPL printer languages. The download page for the utility includes a complete list of compatible printers. Both the Zebra Setup Utilities and the built‐in driver are compatible with 32 bit and 64 bit Windows 2000, Windows 2003, Windows XP and Windows Vista. Yes, the driver has passed Microsoft Certification. For any other questions on the GC420 printer or help in finding the right printer for your needs, contact us at BarcodesInc.